Elbrus is well-known as a destination for climbers, as it is the highest mountain in Russia. It is on the list of the seven summits and is only a couple of kilometers away from the border with Georgia. It is curious that from the technical point of view Elbrus is considered the easiest peak to summit, out of the mounts in the list of the highest peaks. The peak is a part of Caucasus mountain range, and there is a standard route to climb the mount. The main danger about climbing the peak is weather, which may change very rapidly in this area. Elbrus was formed a while ago and is an extinct volcano, and the last eruption took place around 50AD. At the moment, the crater of the mount is filled with ice and snow. Elbrus features a geometrically correct conical shape and has two main summits, the Western with the height of 5642.7 meters (18.513 feet), and the Eastern, featuring 5621 m (18.422 feet). The first ascent of this mount dates back to 1829, when Killar Hashirov managed to step on the East Peak of this mount. In about fifty years, 1874, the West Peak was conquered by a group of climbers led by F. Crauford Grove. 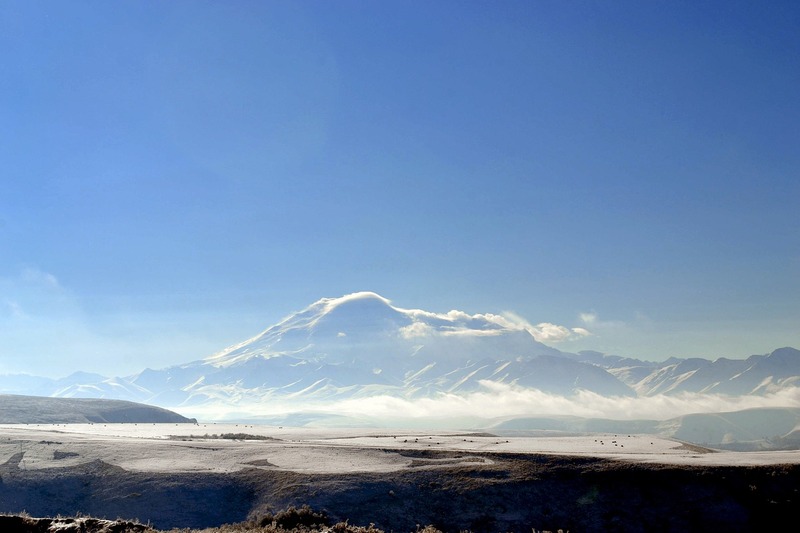 The peak of Elbrus geographically lies directly on the border between Asia and Europe.